Wedding tomorrow, but what to wear? One of my besties, Megan, is getting wifed (married) tomorrow at Madonna Inn and I'm not sure what to wear or how to style it. Help? 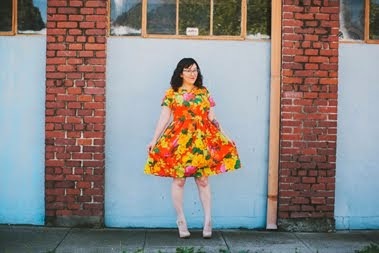 I sewed up another Hazel dress for the occasion (an actual post to come), but I keep second guessing myself. Part of the reason that I chose the fabric is because Madonna Inn is known for the color pink. Pink is everywhere in that place! I think you'd look adorable in the pink and black! Very Grease, but in a good way! Pink is a must! For the Madonna Inn the more outlandish the better! I'm almost thinking black belt, black heels and leopard cardigan. Oooh that would be cute! Have you been to Madonna Inn? I know that you're from CA, just not sure whereabouts. I love the idea of black accents with the pink. You have a great outfit in your hands. Here's another vote for the pink and black combo, I think you'd look great! Thanks, MarrieB! When are you sewing up your next version? I'm so addicted! I love the pink Hazel however you style it, but the black would definitely go. Thanks, Dawn! I just wasn't sure on the black because the last dress I made I styled with black. Wasn't sure if it would be too much if I did it again! Either way you're going to look fabulous; both of the dresses are wonderful! That is literally no help... Is it? I say go the pink - the dress is adorable and it is always fun to match in with the venue! It will look great with the black too. I look forward to seeing the pics. I would wear the pink polka dot hazel with the leopard print cardigan! What do you think? oh I'm so excited for Megan! You will look so cute, as always!! Ooh, you'll look so cute in either outfit! I vote pink, though! What did you end up wearing? ?